Sertifikasi internasional di bidang Teknologi informasi merupakan kunci sukses untuk mencapai jenjang karir. Tidak dapat dielakkan lagi, persaingan global membutuhkan keahlian yang diakui secara internasional sebagai bukti ‘Proficiency’ dalam bidang teknologi informasi. 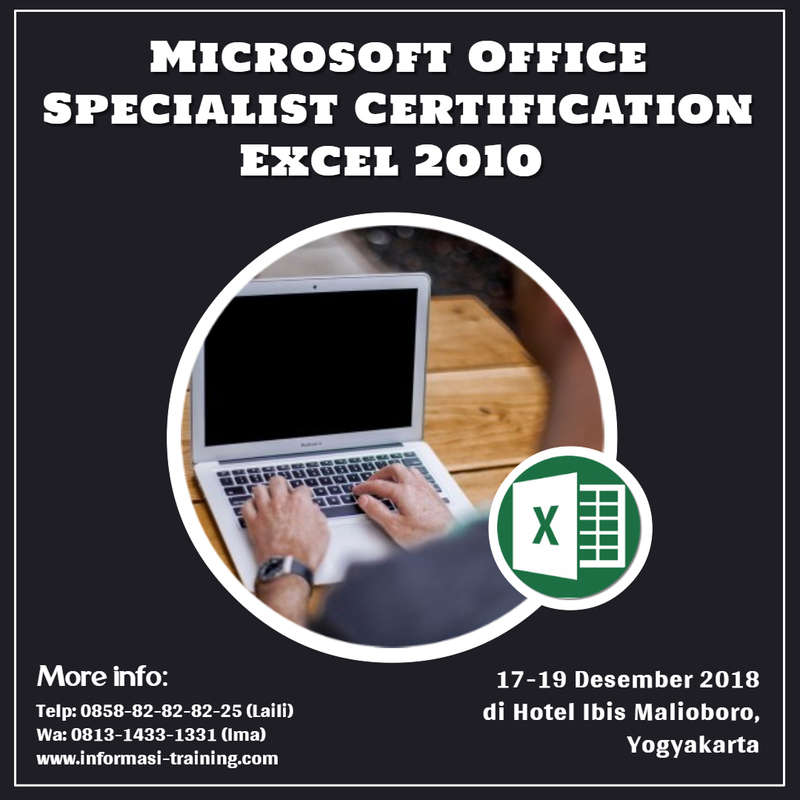 Sertifikasi internasional Microsoft Office Specialist dibidang Excel 2010 membuktikan bahwa peserta pemegang sertifikasi ini memiliki kemampuan uptodate untuk mengoperasikan Microsoft Office Excel 2010 dan secara internasional diakui memiliki kemampuan professional Microsoft Office Excel 2010. Membekali peserta untuk memiliki kemampuan professional mengoperasikan Microsoft Office Excel 2010 dan mengantarkan peserta mendapatkan Sertifikasi Internasional Microsoft Office Specialist Excel 2010. Summarize data using a formula. Look up data by using a formula. Use conditional logic in a formula. Format or modify text by using formulas. Seiring berkembangnya teknologi terutama teknologi perangkat bergerak yang ditandai dengan semakin maraknya penggunaan perangkat bergerak, berkembang pula kejahatan yang difasilitasi oleh perangkat bergerak. Setelah mengikuti pelatihan ini diharapkan peserta mampu mengidentifikasi serta menganalisis perangkat bergerak yang ada sehingga bisa digunakan baik untuk pembuktian di persidangan maupun keperluan lainnya. Life in purchasing world is faced with ever growing issues and a very dynamic landscape. With increasing prices and cost of everything around the world, Purchasing Professionals held a key role in keeping operational cost low and is the frontline of quality control. To be competent Purchasing Professionals, one must be able to ride over the complexity of the issues of purchasing landscape. For professionals attaining CPP Certification from PASAS has demonstrated his learning capacity, industry Best Practice knowledge, experience, and set competency needed to excel in the purchasing environment by meeting PASAS’ standard that are accepted by various Local and Multi-National Companies and will add value to their company. CPP Certification and other Supply Chain Certification by PASAS Singapore are recognised by various multi-national corporations and endorsed by European Council of Leading Business Schools (ECLBS). Purchasing, Procurement, and/or Supply Chain Managers, Business Owners, Purchasing/Procurement Operators. 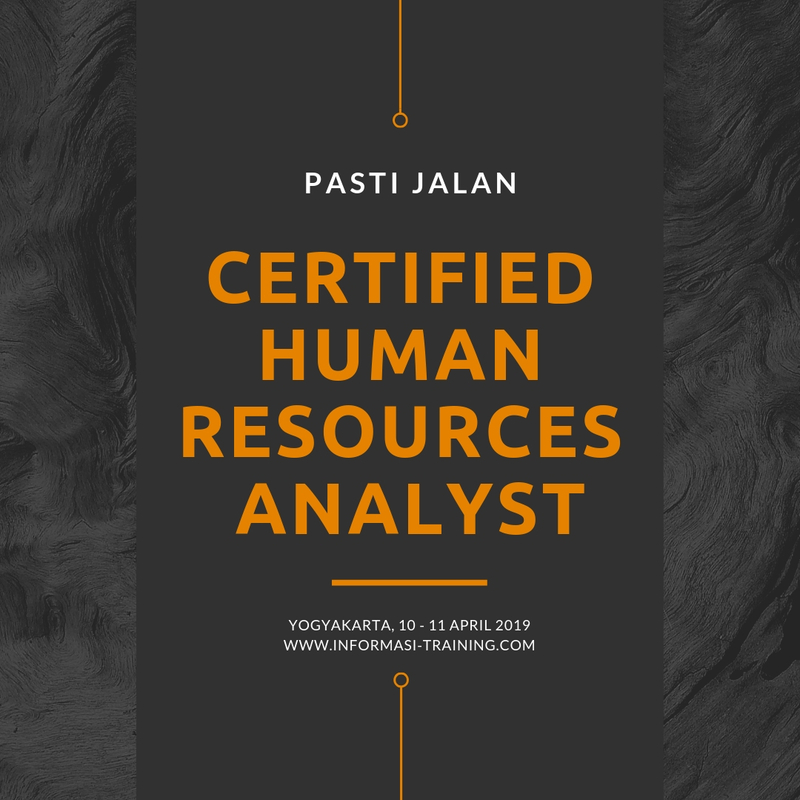 As more human resource professionals are invited to participate at the executive level, project management skills and processes become critical tools in meeting the organization’s strategic talent and management objectives. Through training and implementation of project management principals and processes, the organization can reap the benefits of clear communications; an understanding of performance expectations; vertical alignment of human resources (people) to drive strategic goals and objectives; and improve overall productivity. disparate although related internal operations. Successful project managers, and human resource professionals who work with them, must call forth skills in leadership, organization, planning, and understanding of the essential aspects of project management. This course is designed to broaden your understanding of project management principles, raise awareness of skills and knowledge needed to successfully execute project plans and manage change initiatives, as well as build understanding of potential risks and pitfalls that often befall project implementation. 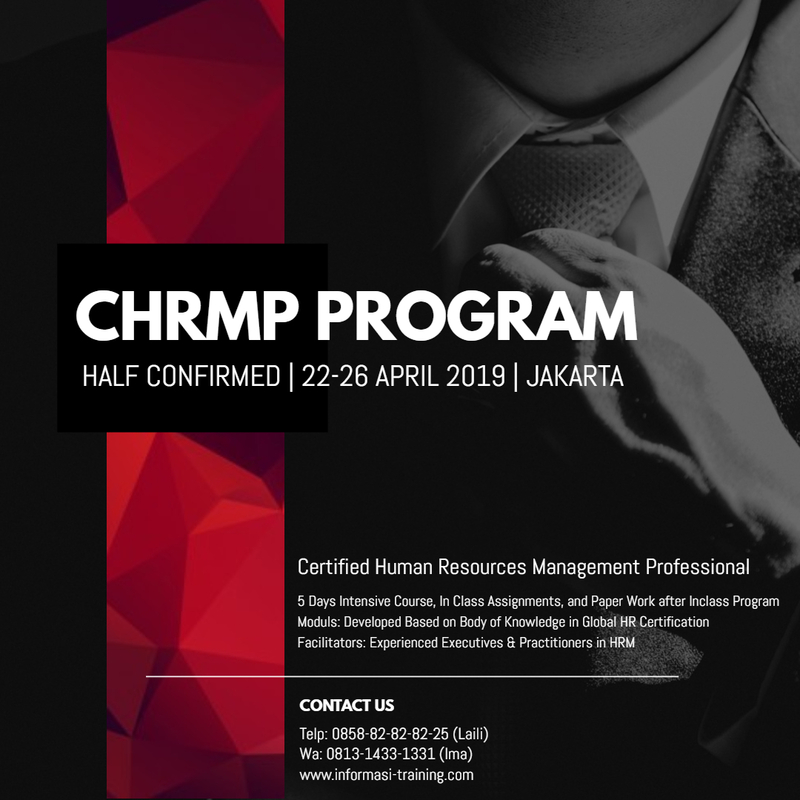 Finally, the training of basic project management skills and concepts will increase efficiency in your department, develop your staff and provide an additional level of credibility within the organization. Define, explain and apply the five project management process groups: Initiation, Planning, Execution, Performance, and Close. Define and explain processes used to determine project feasibility and project cost/benefit analysis to come to a decision on project viability and potential return on investment. Identify parameters of the Initiation process to develop the business case, including the executive summary, problem definition, project overview, strategic alignment, cost/benefit analysis, alternatives analysis and approvals. Enterprises today rely on IT for the delivery of business critical services to the end consumer. Therefore it is paramount that the mission critical data centre is designed, maintained and operated with high-availability and efficiency. However the ever changing technologies put an increasing pressure on the data centre managers together with a faster pace in which these changes are required. In addition to this, there is a vast number of companies where the data centre is a shared responsibility between the IT and Facilities divisions, each having their own values and standards to which they believe a mission critical site ought to be running. This course brings participants up to speed with the data center design, maintenance and operations, valuable lessons which will enable a hi-available, flexible, safe and efficiency mission critical data. This three-day course has been designed to expose participants to the key components of the data centre. It will cover and impacts of key aspects like power, cooling, security and safety etc. to provide a highly accessible data facility. In addition, it will address key operations and aspects of maintenance. centre environment for both new and existing sites. Gain awareness of potential environmental threats towards the data centre and solutions against such hazards. This course is targeted towards professionals working in IT, Facilities or Data Centre Operations including those with the responsibility to achieve and improve the productivity of the data centre. Sertifikasi internasional di bidang Teknologi informasi merupakan kunci sukses untuk mencapai jenjang karir. Tidak dapat dielakkan lagi, persaingan global membutuhkan keahlian yang diakui secara internasional sebagai bukti ‘proficiency’ dalam bidang teknologi informasi. Sertifikasi internasional Microsoft Office Specialist dibidang Access 2010 membuktikan bahwa peserta pemegang sertifikasi ini memiliki kemampuan uptodate untuk mengoperasikan Microsoft Access 2010 dan secara internasional diakui memiliki kemampuan professional Microsoft Access 2010. Membekali peserta untuk memiliki kemampuan professional mengoperasikan Microsoft Access 2010 dan mengantarkan peserta mendapatkan Sertifikasi Internasional Microsoft Office Specialist Access 2010. Leadership is defined as “a process of influencing others to achieve a goal.” This course is derived from theory and research and uses real life observations and experiences from both faculty and students. Advanced social work professionals require to leadership knowledge, skills and abilities to better understand and meet the challenges of working within complex and diverse urban social settings that address a range of contemporary social service issues. The course will address a panoply of topics to enhance effective practices. Among these are motivation, communication skills, power and influence, team building and group facilitation, conflict management and various approaches to leadership styles and methods with emphasis on situational approaches and transformational leadership. One purpose of this course is to help participants become more effective leaders and to better understand the demands of leadership. Specifically, the course will serve as a guide for interpreting leadership theory and research and fill the gaps between leadership theory and practice. While not all master’s level social workers will take responsibility for formally leading or managing organizations and projects, but informal leaders do emerge and followershipis intrinsically a part of the leadership process. The knowledge and skills related to power and influence, ethics, values, diversity, multiculturalism, when acting on behalf of client and populations as social work change agents in organizations and communities. The development of skills and to enhance their ability to motivate, communicate, change and support healthy functioning in groups, teams, organizations and community settings. The ability to respond to the needs of diverse and multicultural populations. An assessment of participant strength based leadership skills and the development of a plan to augment their leadership skill. Successful marketing requires a commitment to understand and satisfy customers. Many products “flop” because the company failed to adequately understand the desires or requirements or constraints of the people who will actually be using the product. For example, Motorola designed a cellular phone with world wide capabilities, but which couldn’t be used inside buildings or cars – the two places phones are most likely to be needed or wanted. Thus, much of this course will be devoted to understanding consumers better: measuring their preferences, understanding how those preferences are formed, and understanding whether products or services are satisfying both stated and unstated preferences. This course provides a comprehensive introduction to marketing research, and discusses key concepts, processes, and techniques, as well as their applications. Participants gain an appreciation for the breadth and depth of the subject and its significance for a business enterprise, whether a start-up or an established company. Besides an overview of marketing research, the course covers research design, including qualitative and quantitative data, and quantitative methods used for analyzing research data to make decisions. 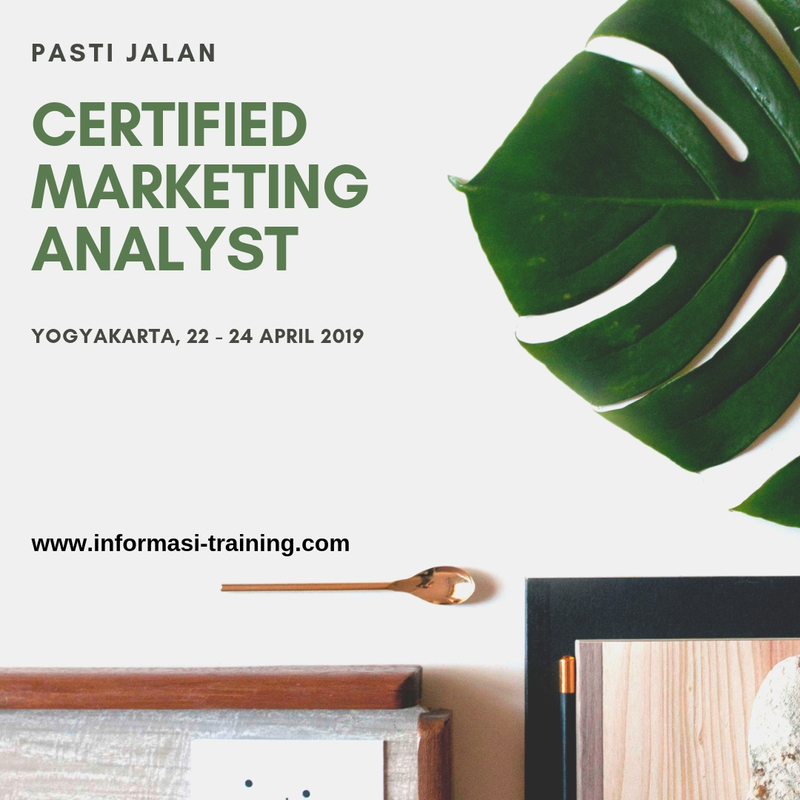 This marketing course is intended for participants who want to increase their knowledge of aspects that affect consumer behavior, and of theories and methods for advanced analysis of consumer markets. The final modules of this course focus on advanced market analysis and development of decision making skills.